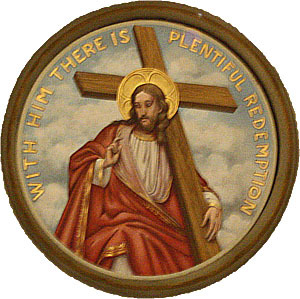 This weekend Redemptorists celebrate the Solemnity of the Most Holy Redeemer. This feast has been celebrated by the Redemptorists on the third Sunday of July since 1749. "Rightly therefore does the Second Vatican Council teach: "The truth is that only in the mystery of the Incarnate Word does the mystery of man take on light. For Adam, the first man, was a type of him who was to come (Rom 5:14), Christ the Lord. Christ the new Adam, in the very revelation of the mystery of the Father and of his love, fully reveals man to himself and brings to light his most high calling." And the Council continues: "He who is the ‘image of the invisible God’ (Col 1:15), is himself the perfect man who has restored in the children of Adam that likeness to God which had been disfigured ever since the first sin. Human nature, by the very fact that it was assumed, not absorbed, in him, has been raised in us also to a dignity beyond compare. For, by his Incarnation, he, the son of God, in a certain way united himself with each man. He worked with human hands, he thought with a human mind. He acted with a human will, and with a human heart he loved. Born of the Virgin Mary, he has truly been made one of us, like to us in all things except sin," he, the Redeemer of man."